February 01, 2017 / Valerie Wilson Travel, Inc.
Aspen will soon become one of your favorite resort towns. Cultural yet athletic, intellectual yet simplistic, extravagant yet authentic, artistic yet absurd: Aspen is the upscale, ski-town home of many definitions. Whether taking to the powder in the winter or bicycling to the top of Independence Pass in warmer months, you will find no shortage of heart-racing activities here. Indie music festivals, high-end mom-and-pop shops, and exuberant dining and drinking spots are common and welcomed experiences. World-class skiing is at your fingertips in Aspen. With four world-class mountains within reach (Aspen Snowmass, Aspen Mountain, Aspen Highlands and Buttermilk Mountain) there is terrain available for every age and ability. The St. Regis Aspen Resort is located at the base of Aspen Mountain and puts you in great proximity to the town and the mountain. Traveling with kids? Ski and snowboard schools are available for kids and teens during the winter months for ages 7 – 17, and children 6 and under ski for free at Aspen Snowmass. Cuddle up under the stars with a horse drawn carriage ride, enjoy the thrilling adventure of dog sledding, snowmobiling, or winter fly fishing, and end the day enjoying s’mores or dinner by the fire pits at St. Regis Aspen Resort. The St. Regis Aspen Resort celebrates the Rocky Mountain experience in style in everything from its guestrooms to its acclaimed Ski Butler Program. The Resort offers superior accommodations from classic guest rooms to the Presidential Suite and Residence Club. Rooms are outfitted with custom furnishings including a leather bed and desk designed by Ralph Lauren. Exquisite marble bathrooms offer double vanities, bathrobes and Remède bath amenities. Select rooms have balconies and fireplaces. The St. Regis Butlers provide flawless personalized attention to each suite guest while in residence. It is the Butler's gracious pleasure to welcome upon arrival and provide for every need throughout the stay. From dinner reservations to theater tickets to a simple wake-up call, expectations will be far exceeded. 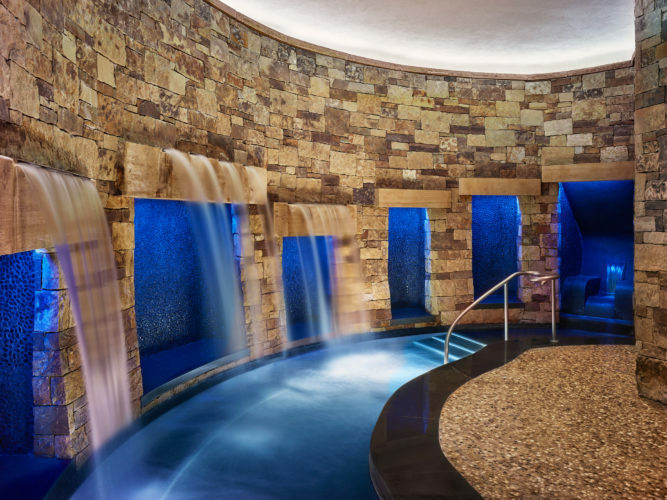 The Remède Spa at The St. Regis Aspen Resort boasts 15 lavish treatment rooms, unique water features, and a 3,500 square foot Fitness Center with instructor led programs and wellness assessments. After a day of activities guests can unwind in the heated pool, rejuvenate in the spa or visit one of the restaurants at The St. Regis for organic, locally-grown inspired cuisine. If you are a self-proclaimed foodie, then a stop at Chefs Club should be on the top of your list. Afterwards, indulge in conversation and cocktails at Shadow Mountain Lounge – ask the bartender to mix you a famous Downhill Snapper.